I've found since I've announced this pregnancy, people tend to ask me a few of the same questions over and over. The first is always, "Is it a boy or a girl?" It is a boy. And the second is always, "Have you had any bad symptoms?" Aside from some heartburn, I have been symptom free throughout this entire pregnancy. Not even once did I go through morning sickness, afternoon sickness, or (like with Darian) evening sickness. In fact, I was so symptom free in the beginning, I didn't really believe I was pregnant until I started showing, even after having it confirmed with an ultrasound! And the last question is always, "Have you had any weird cravings?" Yes I have! I've tried to pay very close attention to what my body has been wanting, and coincidentally, a lot of the cravings I've had coincide nicely with what I've been reading as far as what I need at different phases of fetal development! The body is a weird and wonderful thing when you learn to listen to it. Months 1-2: Apples everything. Even before I knew I was pregnant, I wanted apples. I swear I could even smell them better in the store and my mouth would water. Apple pancakes, apple pie, apple and peanut butter, apple juice, etc anything apple. Month 3: Tomatoes and avocados. I was eating them raw, with salt and pepper as a salad every day. I was in love with them! I actually became obsessed with a Ham and egg sandwich too, but soon found out that Deli meat was on the bad food list, so I had to stop eating it. At the end of Month 3 and beginning of month 4: I started to fall madly in love with fresh pineapple hearts. I ate a lot of them. I loved the taste, the smell, I was like an animal just tearing into whole pineapples. So delicious! I was also starting to find myself falling for dairy again. Lots of milk, cheese and ice cream!! And peanut butter and jelly for breakfast almost every day. Yum! Months 5-6: I find that there is not one thing I'm especially craving, but I have quite enjoyed very ripe kiwi fruit and fresh raspberries. I've also found myself wanting waffles quite a bit. The strangest thing I've craved was at about 20 weeks, we were having Mexican food and Sean ordered a margarita. They brought the tequila in a sidecar for him to dump into the drink, I caught a whiff of it and for many days I found myself craving it. This is probably right when I should have known he was a boy. I don't even drink, so it was especially weird to be cravbing tequila! Needless to say, he did not get any of that! Still waiting to see if that pickles on ice cream myth ever kicks in, but so far this child has steered away from that. 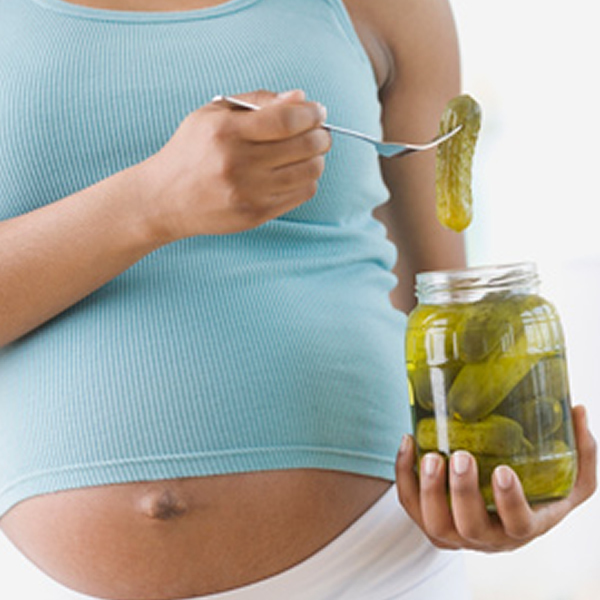 I have eaten a pickle or three, but no more than the amount I eat when I'm not pregnant! Kosher Dills have always been a favorite snack of mine!